Newly inaugurated Mexican President Andres Manuel Lopez Obrador received a traditional cleansing during an indigenous ceremony Saturday in Mexico City’s central plaza, or zocalo. 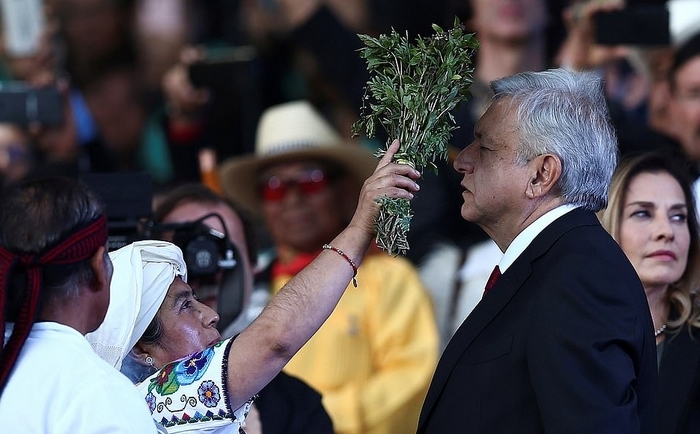 At one point, Lopez Obrador, who was sworn into office Saturday for a six-year term, dropped to his knees in a cloud of incense as indigenous healers performed a rite of purification, brushing him with bunches of herbs. The ceremony — involving representatives of dozens of Mexico’s indigenous groups, many donning traditional clothing — was a highlight of the inauguration day, with tens of thousands of people in attendance. Indigenous people represent about 10% of Mexico’s population, concentrated in certain areas, such as the poverty-stricken southern states of Oaxaca and Chiapas. 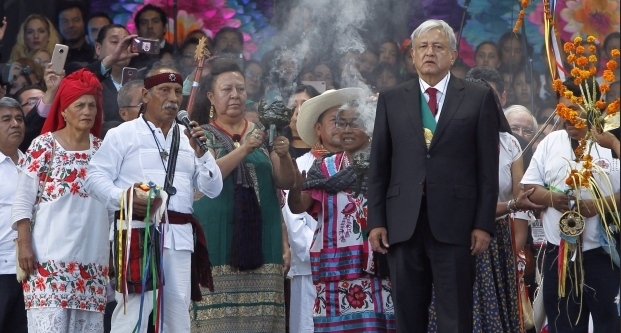 Lopez Obrador and his wife, Beatriz Gutiérrez Müller, were both enveloped in incense as indigenous healers performed the cleansing of the first couple. 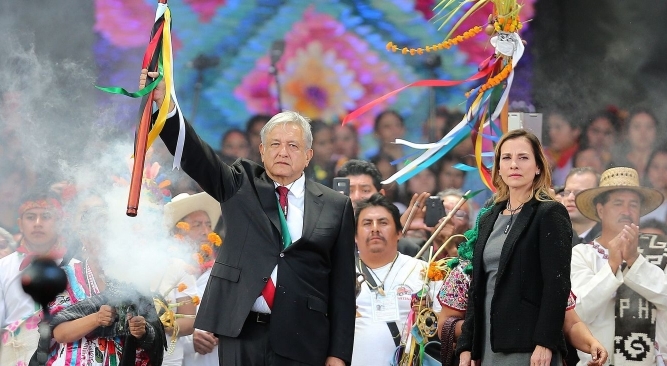 Lopez Obrador received a traditional baston de mando — a wooden staff representing leadership and respect — and later said indigenous people would have priority in various new social programs. 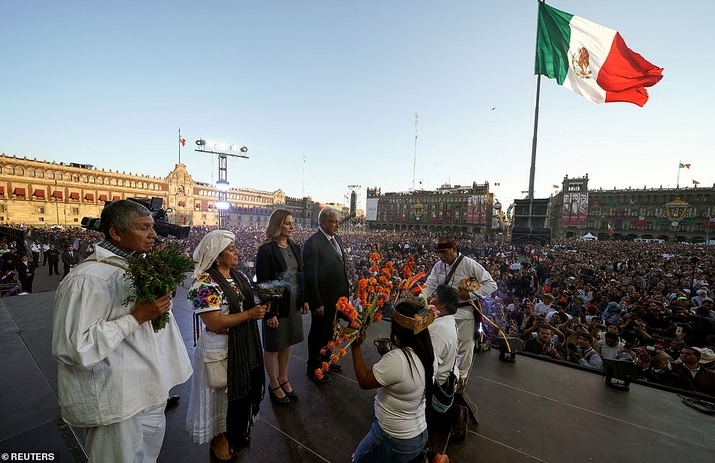 “After receiving the baston de mando, I reaffirm my vow not to lie, not to rob and not to betray the people of Mexico,” declared Lopez Obrador, who held the ribbon-bedecked staff in his left hand as he spoke. Bouquets of flowers and the indigenous guests provided a backdrop as Lopez Obrador addressed the crowd. The president’s speech was meant to be a direct message to the Mexican people, following his afternoon address to Mexican lawmakers and dignitaries at the congressional palace. Observers said it was the first time in memory that such an indigenous rite had been incorporated into a Mexican presidential inaugural event. 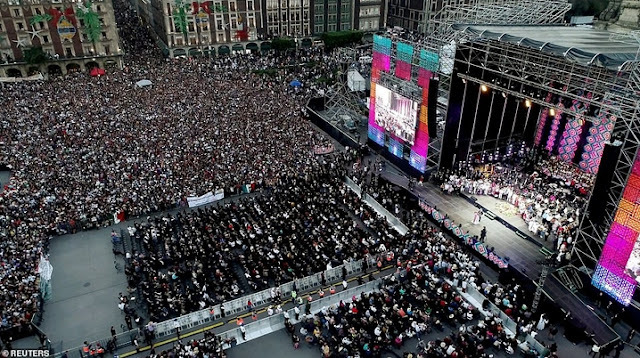 A festive atmosphere pervaded the square as supporters of AMLO — the president’s nickname, after his initials — praised the new chief of state’s expansive plans to shrink poverty and provide jobs, scholarships, improved pensions and other aid for needy Mexicans. Responses to "Mexico's indigenous cultures take the inaugural stage to purify the new president"